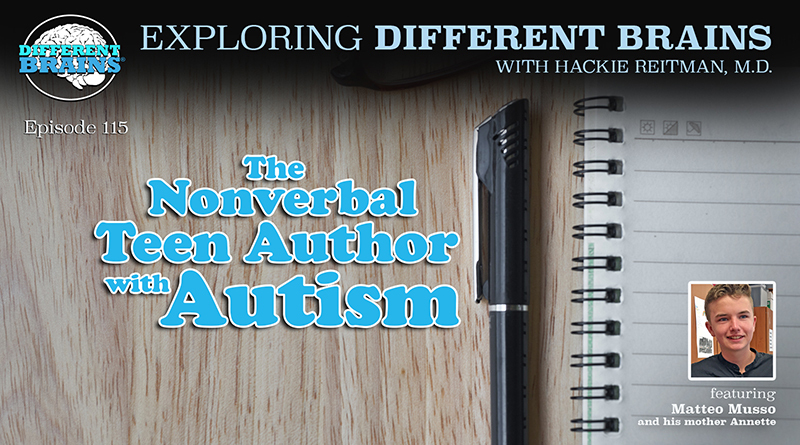 (21 mins) In this episode, Dr. Hackie Reitman speaks with author and neurodiversity advocate Pierre Marsh. Pierre is also a Senior Mediator specialist in Employment and Discrimination at Marsh Mediation Practice. 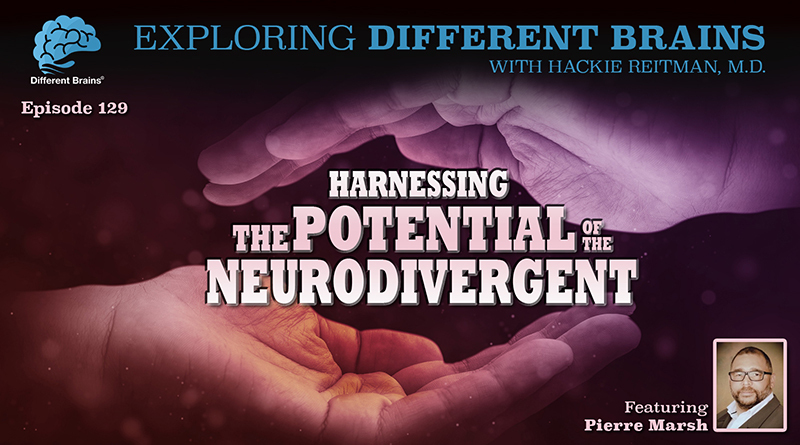 Pierre shares his story of growing up in London with misdiagnosed dyslexia, discusses the importance of encouraging and recognizing the potential of the neurodivergent, and why he decided to tell his story in his soon-to-be-published first book. HACKIE REITMAN, M.D. (HR): Hi, I’m Dr. Hackie Reitman. Welcome to another episode of Exploring Different Brains. Today we have an international superstar who usually is in London, but is talking to us today from Panama, and that is no other than Pierre Marsh, who is going to tell you about his life as a civil and commercial mediator, but more importantly, about his experience with neurodiversity, specifically dyslexia and all associated stuff, so this is going to be a lot of fun. Welcome, Pierre. How are you? PIERRE MARSH (PM): I’m fine; thank you. HR: So what are you doing over there in Panama? PM: Well, funnily enough, when I retired from the fire service after 28 years of service and became a civil and commercial mediator, I decided to change locations because I decided that you can do a majority of what you need to do online, and communicate this way, so why did I need to be in London? So I moved. Simple as that. HR: Introduce our audience to you. Introduce yourself if you could. PM: Basically, I was born in 1964 in London and I have to say, quite an interesting time. I was a mixed race guy at a time when there was a lot of racial unrest. Funnily enough, pretty much as we see today, things haven’t moved on too much. And of course, I was dyslexic at the time, and my mother was very dyslexic, and during that particular time, if you had problems in reading and writing, you were referred to, the authorities, the psychologists, and the psychiatrists who did assessments, and their understanding of developmental issues were considered as pathological issues, and you were treated as such. Me and my brother were placed into children’s homes and then further assessed as being senior maladjusted, because we were having difficulties with reading and writing and not learning, and then we were put into a special school which was called a maladjusted boarding school at the time. And so that was our start, so it was pretty challenging and revealing at the time, but after I left school because we lost contact with our parents, and this is the type of impacts these organizations had on us at the time, we survived by ourselves at the age of sixteen being completely unable – both of us – not being able to read at all, and we found our saving grace, so it’s funny that you mentioned sport, we found our saving grace – like so many people from the neurodivergent families do – in sport, which gave us discipline. It gave us focus, somewhere to go to, and more often than not, started to get us qualifications where you didn’t have to take written tests. So these were practical tests, so we became swimming teachers and diving teachers to start with, which gave us a living, lifeguards, so from the age of sixteen up until, I suppose, the age of eighteen, my brother and I survived in the adult world by learning through sport and teaching through sport. HR: Well, that’s great. Now let’s fast-forward to – just for the sake of our audience to catch up – tell us what you do now for a living. PM: Well, I’m just finishing a book, which I thought was very important. I took time to write this book about neurodivergence. And this is why I wrote this book, because I became very involved in the fire service when there was a law changed in 2004 which said that people who have a disability or have a neurodivergence could actually become firefighters. There was no restriction on it. Before that, the law didn’t account for them. Funny enough, in the fire service, there’s huge amounts of dyslexics and dispraxics and Asperger’s that you’ll find in lots of work, occupations. But the system didn’t have a way of mediating that difference with the very strict structures of the organization, and also the organization didn’t really have a clue how to develop people who were neurodivergents, who came out and said they were neurodivergent. I developed these skills, and also this particular understanding, and when I left the fire service, I decided because I studied two degrees while in the fire service just to prove to myself that finally I could read and write and obtain academic qualifications, I wanted to put them to use, and I put them to use through taking further qualifications, became a CPD provider, I was trained in that. I took a course in dyslexia within risk-critical occupations, where I was offering organizations the opportunity to understand a different way of thinking which was very effective in crisis situations, which seemed to be overlooked somewhat. I also help people who deal with very stressful situations, how to understand their thinking styles and apply it even though they’re usually trained for a very strict, sequential process in order to achieve outcomes. Moving that forward, I started to get involved with one or two other people who were activists if you like in neurodivergence. A doctor who is a dyslexic himself and also an author and we started to get involved in producing links with the government in terms of what they should be thinking about, and we actually did a Westminister comission, a short commission which looked at the barriers to employment through a neurodiverse perspective. But all through that, none of it works, unless you have someone who’s going to be an advocate for neurodivergents, from a neurodivergent’s perspective. Because it’s all technical. If you’re having challenges at work or challenges in business, often you come from a neurodivergent’s perspective, and the people you’re talking to, maybe with good faith, maybe not with good faith, impact on that dialogue, that association which really restricts progress and understanding. So that’s how I got involved with that. HR: Very interesting. Very interesting. Tell us what made you decide to tell your story and to advocate and to be out there and to write books and to do all the stuff you’re doing. PM: One of the things is when I said I was in a children’s home, the psychiatrist turned around and assessed me as being retarded and having all of these lack of capabilities. Now that was science. That was a scientific perspective at the time being applied in good faith to measure what someone was and the likelihood of where they would come. Obviously, in my mind, I’m happy to say that that analysis was completely wrong and the science was completely useless. It was looking at particular things other than intellect at that time. One of the things I’m passionate about, there are so many brilliant neurodivergent people out there, and they’ve done very well or not so well, and I believe that what we’ve got to do is get that intelligence released and we’ve got to talk about it, and we’ve got to talk about the ugly side of the process as well in order to release the bullets. For example, one of my friends, I know you’re a doctor; he’s a gynecologist; he’s definitely on the spectrum. You’re talking Asperger’s, sort of on the spectrum, and for years when I knew him, we really didn’t talk a lot. We were really focused on computer games all the time. But when he came to one of my courses, he suddenly realized a lot of his difference and the challenges he was having with hospitals and very high requirements and systems and so forth, that was because of his perspective and what he needed to do was understand his perspective in order to have a better chance of doing well at work. So even if you are a senior house doctor, that doesn’t mean to say your potential can’t go a lot further if you understand your perspective a bit better. Because no one teaches you it. It’s like a discovery you have to go all through your life. So this is what the idea of the book is, to actually point out, first of all, the language, which identified me as being senior maladjusted and all these types of things. It’s not necessarily the best language to identify the capability of the person, however, it’s the dominant language. What we’ve got to do is develop a language which is, hold on, that’s one way of thinking, but here’s a neurodivergent way of thinking. This is where we believe the intelligence is, and more importantly, we believe this is where other disciplines have to start doing the work to understand how to create a pedagogy, an education system which releases people right from the very beginning, so that they really do fulfill their full potential. HR: And in order to do that, it cannot, by definition, be one-size-fits-all, and it must expose the individual to different types of lives they can have, so they can pick and choose. Our interns here at Different Brains, they get exposed to video editing, audio, they get exposed to writing, researching, doing articles, webmastering, and they find what they like if they get exposed to it. And our educational system and our employment system doesn’t really do that. It’s much more inclined to have one-size-fits-all and then put you in one compartment and then that’s it. How can our audience learn more about you? HR: I didn’t mean to interrupt you; I’m sorry, but I did want to ask you this. When you’re writing the book, and I know this when I wrote the Aspertools book, which was published by HCI Books, who did the Chicken Soup for the Soul, to my surprise, they gave me a contract for that, but I find, and I’ve written six screenplays, too, but I find writing gets defined wrongly. What do I mean by that? Some people think that writing means you have to sit down at a computer. Some people think you have to handwrite it out. Some people think you dictate it. I do all three, because they all use different parts of your brain, you know? I can do a scene for a script, and I can type it, and I can write it, and I can dictate it, and it’s like three different scenes, because it’s a different wiring in your brain going on. What is your method? PM: Well, my method is traditionally I’ve been writing down on a computer, and the problem I have is the sequential of it once it’s all down there. When you go on a computer and you’re trying to find something, there’s yards and yards and yards and yards and yards of it. When you try to organize it into a sequence which makes sense, this is the sequential process which needs to kick in now. It becomes very challenging. So what I’ve started to do, I need pictorial references. So this report, where I’ve got all of these photographs which I’ve taken of the report, becomes the story. So I use one computer with all the photographs with the story, and then once I need to get the sequential process in, I bring the photograph into the text, which then stabilizes everything to make sense. So that’s really how I’m doing it. What I would like to do is print the whole thing out and have it all on the floor, but at the moment, I haven’t got time. I didn’t just put it into place. So using visual references. That’s the way. HR: Very interesting. One of the techniques the old timers taught me – and I did this when I was writing my first thing, my first script – using index cards and thumbtacks, and you can always just move the index cards around how you want. If we fast-forward to now, what I do is I put everything in a master word document, and every time I work on it, I then save as a different name to the document with a new date. And I can always search a Word document for any phrase or word that I want if I forget where I put it and everything. I find it myself. I don’t worry about editing by deletion, because that’s what the first draft editor can do. In other words, I try to teach that people think they’re supposed to be the whole package and we’re not. We can do one thing, and somebody else can do another, so I was very fortunate. When I’m writing like a book or something, I just spew it all out and I give it to the editor, the first editor, the first draft editor I give is my cousin Peter Bockner in Massachusetts, but I dump it on him and I say, “Organize this.” You got in some kind of organization. HR: Well, I’m sure it’ll be successful and we’ll look forward to it. (26 mins) In this episode, Dr. Hackie Reitman speaks with Matteo and Annette Musso. Matteo is an author who also happens to be a nonverbal teen on the autism spectrum. 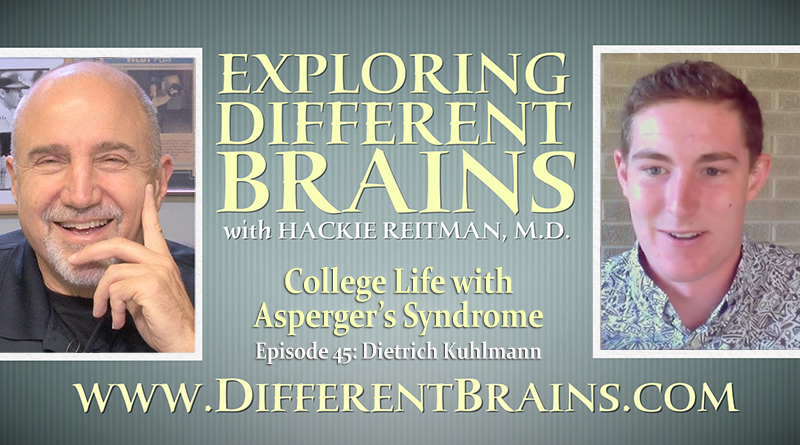 In this episode, Dr. Hackie Reitman speaks with Dietrich Kuhlmann, a sophomore at the University of Miami who also happens to have Asperger’s syndrome. 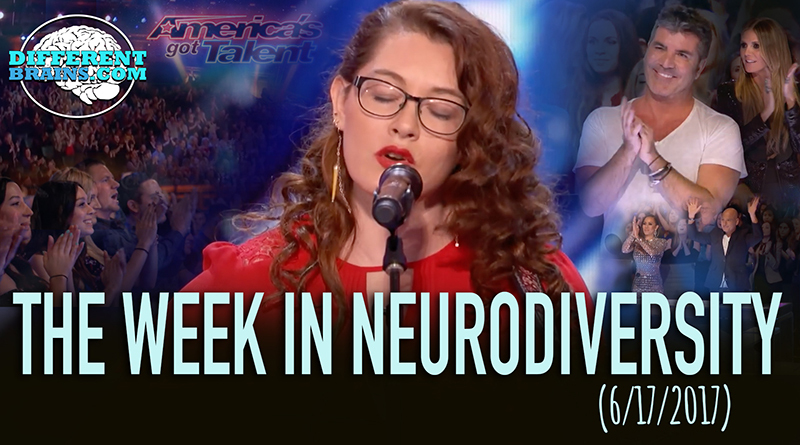 (4 mins) In this episode, a teacher dyes his hair for a boy with epilepsy, a an 11-year-old with autism inspires others to overcome their fears by riding roller coasters, and a deaf woman gets a standing ovation with her performance on America’s Got Talent! These stories and more in this week’s edition!